Do you have the right price for existing products or services? Do you know what the price should be for a new product yet to be launched? Are your customers willing to pay more for a given set of benefits? We help you with all of that. Through pricing science we help you optimize existing as well as new prices. PriceBeam changes all that. Confirmed to be accurate in thousands of projects, PriceBeam takes the underlying technology to a unique, never-before-offered self-service to companies of all sizes that quickly, accurately, and affordably discovers your customers' willingness to pay for your product or service. Can you recognize your business in some of these situations? We can help. Do you need to price a new product or service? What features make customers willing to pay more? What is the optimal price? Are you charging the right price for a product or service? Could you charge more? Without losing overall revenue? How do you implement a successful price increase? How big an increase can your brand justify? What are customers willing to pay? What should the price be vs competition? Do customers agree with that position/premium/discount versus the competitive alternatives? How much value do customers put on your products or services? What features can command a premium price? What segments are willing to pay more? Do all customer segments share the same willingness to pay? Who is willing to pay more? Does it require product differentiation to target them? 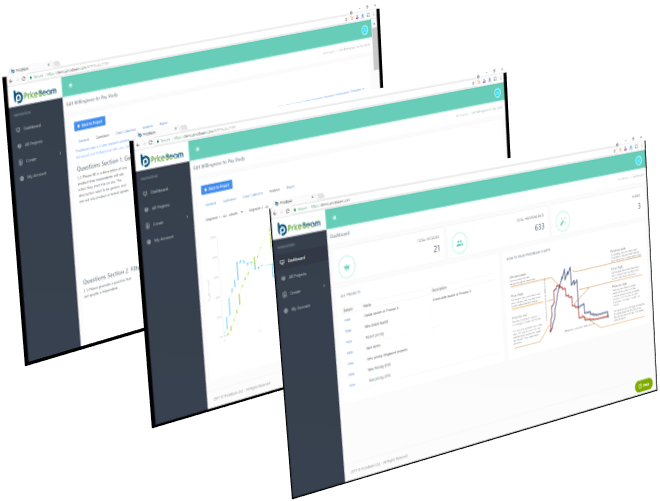 PriceBeam's cloud platform takes care of all the details and hard work of doing pricing research. All you have to do is describe your target market and your product or service. With PriceBeam's solutions you get extra-ordinary and immediate pay-back on your pricing actions. PriceBeam projects have a near-instant payback. Knowing the right price instead of guessing means you can improve your profits quickly. Our cloud-based platform is very easy to use. All you have to do is define target market and describe the product. We handle all the details of conducting professional market research. Results are available in as little as a day and never more than a few weeks, regardless of complexity. PriceBeam's cloud platform also delivers results 24x7. You can access your online account at any point in time, and launch new projects. No need for long waiting periods to get set up. Create, manage and analyze research at your fingertips. Pricing is THE most powerful profit lever. Expand research by comparing willingness-to-pay across multiple products or services. Yours as well as the competition. Understand what features or benefits are valued by customers, and see how it impacts willingness-to-pay.